Long time friend, workout buddy and client, Karen Hansen, will take the stage in Ottawa, IL next week at her ultimate personal best! Here are a few pictures of her from 9 weeks out and 1 week out...for more of Karen and the other clients I have preparing for competition this season see my Steps To Success section of my members area. I am so Proud of you my friend!!! It's Spring Break for Alyssa, so we headed to the Field Museum for the day on Tuesday with the kids..we all had a great time! Also- Logan is 9 months old today! Logan with the Easter Bunny for the 1st time! Pictures of my spring competitors and "Team Abrams" in my members journal this week...also my spring/summer travel schedule (competitions I will be attending). Logan 8 1/2 months old, Wade 4 1/2 years old! 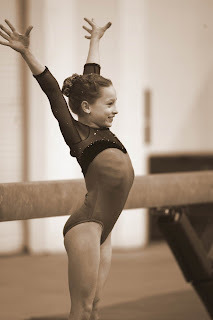 Alyssa- finishing her beam routine! A father of three and professor gives his final lecture... he only has months to live. It's not a talk about death, but about achieving childhood dreams. Inspirational and moving. she will now move up to competition level 5. Sunday, May 4th my client Gina, (who will be competing in figure May 3rd), will be walking in the Walk MS 2008, which benefits the Greater Illinois Chapter of the National Multiple Sclerosis Society. Approximately 400,000 people nationwide, including 20,000 here in Illinois, live with the devastating effects of this chronic, progressive, and often disabling disease of the central nervous system. With so many families affected by multiple sclerosis, I am reaching out to you in the hopes that you will be able to help me achieve my fundraising goals - or that I might even encourage you to participate in this exciting annual event! I am looking for sponsorship of any amount for the walk. It is people like you--friends and family and associates who support my fundraising goals and the goals of the more than 16,000 people who will be walking with her-- that are key to making the National Multiple Sclerosis Society’s ultimate mission of finding a cure possible, and, in the meantime, providing the crucial services to those living with multiple sclerosis! It’s faster and easier than ever to support this great cause—you can make your donation on line by clicking Support and following the prompts. If you would prefer, you can also send your tax-deductible contribution to Gina or directly to the Greater Illinois Chapter. More information about the National Multiple Sclerosis Society, Greater Illinois Chapter and its programs can be found at http://www.msillinois.org/. Whatever you can give will help, because every bit counts. Gina would greatly appreciate your support and I will keep you posted on her progress. If you are able to contribute, please make an online pledge by the Walk MS event date-- Sunday, May 4,-- or mail a check on my behalf before the event date to the address below (and be sure to make checks payable to the National Multiple Sclerosis Society and write my name in the check’s memo section). Together we can lead the fight against multiple sclerosis! To donate online, please visit Gina's Personal Page. Make all checks payable to the National Multiple Sclerosis Society. I am sure by now most of you have heard about the major statement the judges made at the Ms. International placing Iris Kyle in 7th place. My thoughts on what took place and over 100 photos from the weekend will be updated to my members area this week. I must say Yaxeni Oriquen looked amazing!! The best overall package I have ever seen her bring to the stage, in my opinion! A well deserved win for her..
Ms. International 2008- 20th Anniversary! It was also wonderful to see Tracy Beckham receive the invite to compete after her overall Team U win earning her pro status. I would like to see more of that in the future from the NPC! Dave Riley- we guest posed together in November 2005. He is now preparing for the USA's. Kris Murrel - we competed together at the 2005 Jr. Nationals- both placing top 5. Rhonda Riesselman- a previous client who was part of Team Abrams in May 2007. Colette Nelson- always fun to see ya girl!! Frank Zane- the one and only. Monica Brant- the woman helping her ( in white) at the Muscle Developement table came up to me to say what an inspiration I have been to her and how she still holds onto one of my magazine's I appearred in. She was so sweet! What a wonderful thing to hear! Jodi- of fitweardesigns.com , who chose me to recieve a sponsorship suit in 2006. The suit that I appear in on the cover of my dvd. Greg-one of my clients competing this spring! The very first wedding at the Arnold! Logan hangin' out with daddy! Little Logan is ready for bed after the men's finals!